That is a neat piece of equipment. 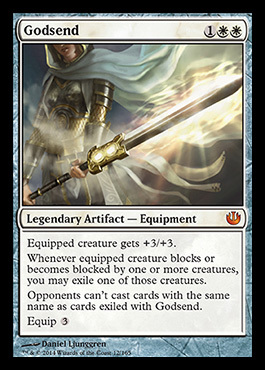 Also, a pretty evocative legendary sword – it perma-vaporizes one creature per fight, punching a hole in the universe so that no more of them can be summoned. I like it. Like the name, like the effect. This entry was posted in Flavor, Journey Into Nyx by parakkum. Bookmark the permalink.